The key to creating a destination wedding that no one will ever forget is to make it unique to the bride and groom. As you begin to plan for the big day, keep these three questions in mind: How can I make it feel like us? How can I make it unique? How can I make my guests completely comfortable? Here, we offer tips to help you personalize your day. A few weeks before the wedding, send each of your guests a teaser via snail mail to get them excited for the upcoming trip. Some ideas: a guidebook with the location of your wedding bookmarked, or a gift that’s super-specific to your destination—such as a fresh lei for a wedding in Hawaii or a bag of gourmet coffee beans from Costa Rica. Add a section to your wedding website that makes prepping for the trip a piece of cake. In addition to giving guests a heads-up about all the special events they’ll be attending, include dress-code information and a list of things they won’t want to leave home without, such as sneakers if you have any hikes or other adventure excursions planned), sunscreen, and a shawl or light jacket if you’re jetting off to a steamy location that’s cool at night. It’s a nice and organized way to lend a helping hand while giving them a sneak peek at the events you’re planning. Guests traveled a long way to celebrate with you, and putting your personal stamp on everything they touch is a way of letting them know how much thought you put into their stay—and how much you appreciate their being there. For instance, have a daily letter delivered to your guests with everything they need to know about the upcoming day such as the the timeline, temperature, tide report, meal info, and special activities they won’t want to miss. Gift your guests with stylish, completely customized luggage tags that unify them as a group and serve as keepsakes long after your wedding weekend. When to distribute them is up to you—mail them to your guests before they begin their trek, or hand them out after the wedding, before they jet off for home. It’s all about the details: Place a pretty framed poster at the reception desk to greet guests as they check in, and appoint your personal attendant or wedding planner as your “Wedding Concierge” to answer any questions your guests might have. After a long day of traveling, it’s hard to resist a few sips of something delicious. Have the front desk welcome guests at check-in with your favorite drink: hot cocoa or mulled cider in a chilly locale, sparkling cider or champagne at a swanky resort, or a jalapeno margarita in Mexico. A table stocked with cool, moist, lemon or lavender scented towels is especially refreshing for those that have been traveling all day (especially in a warm locale). Upon arrival, give your guests a warm welcome with a gift to prep them for the weekend. You don’t have to go overboard, but a few bottles of water and a handful of snacks that satisfy guests’ sweet and salty cravings is a thoughtful touch. And don’t forget the little ones—if you know there will be kids in the room, milk and chocolate-chip cookies will certainly be well-received. Think about non-food items that can come in handy for the trip as well, such as a map of the resort or city, notebook and pen, or a disposable water-proof camera. If possible, take your attendants on a surprise excursion—a snorkel trip or a sunset cruise—as a thank-you-for-being-in-the-wedding gift. Don’t have the time? Personalize something they can use again and again instead. For the groomsmen, gift customize guy-friendly items such as golf balls and watch faces with initials or nicknames. Give your bridesmaids a shawl or wrap that they can use if the evening gets chilly. Arrange for hotel staffers to leave a different treat on guests’ pillows every night. Think chocolate chip cookies if those are you and your fiance’s favorite. For rooms where there are children, adding the gift of a different storybook each night is an adorable touch. Arrange for a local artist to perform or provide a service during the reception. There are plenty of options: cigar rollers, tarot-card readers, dance troupes, bagpipers, gospel choirs, flamethrowers—you get the idea. Ask the front desk to distribute goody bags full of munchies for the plane as guests check out. Pick something you can assemble in advance and include a farewell note from the bride and groom. Recently engaged? 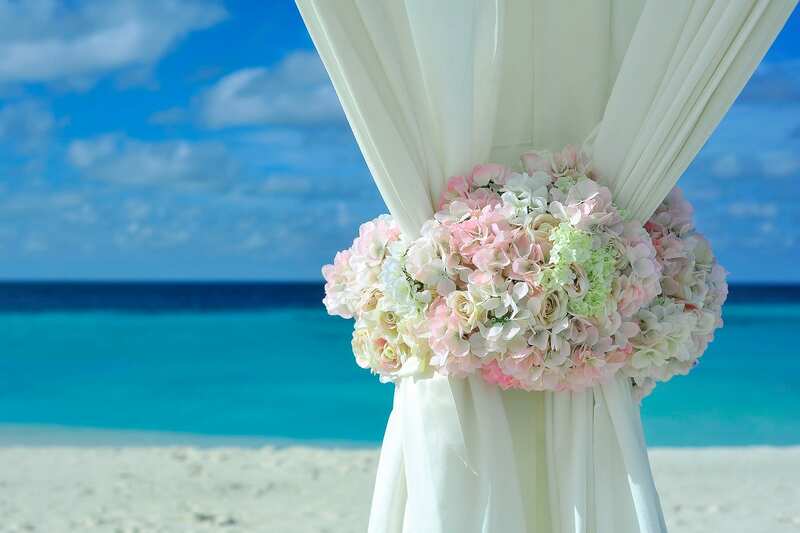 Call the destination wedding and honeymoon specialists at Enchanted Honeymoons Travel at 402-281-3022.